Looking for a New Honda Fit in your area? CarGurus has 1,101 nationwide Honda Fit dealers with 26,104 new car listings. The Honda Fit stands out among economy cars by actually being a well-rounded and complete car for the price. Once upon a time, buying a new car on a budget meant scraping the bottom of the barrel. Sure, it had a “low, low” price to get you in the door, but for that price, you did not get a whole lot of car. For most of its existence, the “econo-box” was a much-lamented auto segment. In the past year or more, we’ve tested dozens of new compact crossovers. And at the risk of sounding like a broken record, they are all basically high-riding hatchbacks. Their high ground clearance suggests capability, but in reality, accomplishes little more than what a hatchback already does. In that context, it's refreshing to see a car like the 2018 Honda Fit. It has cargo space that not only rivals but exceeds that of some compact crossovers. 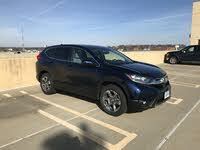 It also boasts many of the tech and safety features of those pseudo-SUVs. And it accomplishes all this in a small hatchback layout that makes for a great city car. The Fit has undergone a refresh for 2018. The update brings in more advanced safety features, an updated suspension for sharper handling, and the return of a Sport trim. Overall, the Fit has the same general outline of past iterations, but with smoother edges. It also has a scaled-down version of the headlight and grille design found in other Honda vehicles. But aesthetics are secondary in the Fit. The main selling points of this car are practicality and usability. In that sense, the Fit is a rock star and a much more versatile car than rivals such as the Toyota Yaris, Nissan Versa Note, and Chevy Spark. Inside, the Fit has an attractive and functional interior, with an impressive array of cupholders and cubbies, in both number and ingenuity. The layout clearly evokes function, but is easy on the eyes. The 2018 Fit comes in one of four trims: LX, Sport, EX, and EX-L. The Fit LX comes standard with power locks, power windows, and air conditioning, which was not always a given in this vehicle segment. The base LX also provides standard creature comforts such as a power moonroof, four-speaker stereo, Bluetooth connectivity, and a USB port. The Sport model comes equipped with 16-inch alloy wheels, fog lights, an upgraded lower front spoiler, and side underbody spoilers. Inside, the Sport adds a 6-speaker stereo, a leather-wrapped steering wheel and shift knob, and a 7-inch touchscreen. Moving up to the EX model, you get push-button start, cargo tie-downs, SiriusXM satellite radio, and telescoping sun visors, which might not seem like a big deal, but when the sun is low in the morning, that’s huge. The EX also has the SmartLock feature, which automatically locks the car’s doors as you walk away from it. Moving to the top of the trim range, the EX-L boasts leather upholstery, hence the L in the name. It also has heated front seats and heated, body-color side mirrors with an expanded view on the driver’s side mirror. These mirrors feature integrated turn signals on both sides. The EX-L model is available with a navigation system, but as you’ll learn later, the Fit can come with Apple CarPlay or Android Auto, meaning you can use your smartphone for navigation. There's only one engine in the 2018 Honda Fit, a 1.5-liter inline 4-cylinder. It sends power to the front wheels through either a 6-speed manual or a continuously variable transmission (CVT). Sport, EX, and EX-L models with the CVT also get steering-wheel-mounted paddle shifters, allowing you to hold simulated “gears.” With the 6-speed manual, that little engine makes 130 horsepower and 114 pound-feet of torque. It puts out 128 hp and 113 lb-ft of torque when paired to the CVT. That might not sound like much power at all, but it's enough for the Fit to get out of its own way and whip around town. It has a bit of pep pulling away when the light changes or when you step on it below 50 mph. When you try to punch it at higher speeds, the Fit doesn’t seem to go much faster. The engine just makes more noise. 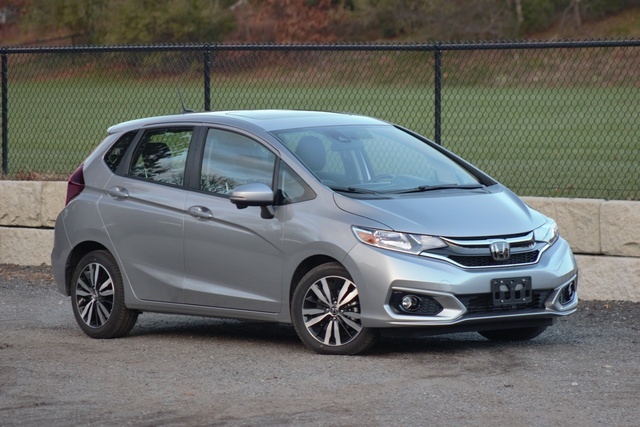 The Fit has a tall, narrow layout, which one might think would lend itself to being top-heavy or having too much roll in turns. But the Fit bucks convention and exhibits sharp handling. The sprightly hatchback stays level through corners, at low speeds and high. It also exhibits responsive, well-weighted steering. The combination of these attributes makes the Fit uniquely adept at whipping around the city and suburbs and darting in and out of traffic. As for EPA fuel-economy estimates, the 6-speed manual returns 29 mpg city, 36 highway, 31 combined. With the CVT, fuel-economy estimates jump to a claimed 33, 40, 36. In our week with the Fit, we found combined fuel economy of 29.1 miles per gallon. Granted, we were doing a lot of city driving, but the truth is to get anywhere in a hurry, you will likely return fuel-economy numbers below the EPA's estimates. To understand the charm of the Fit’s versatility, you need to experience the cabin and all its little tricks. It’s well thought out, with deep cargo pockets and cup holders in clever places, like in the space to the left of the steering wheel. The Fit’s upright profile makes for plenty of headroom and better rearward visibility than you might find in other small cars—even other small Hondas, like the Civic. The Fit has a standard 60/40 split-folding rear bench that doesn’t require you to remove the headrests or move up the front sweats to drop them flat. 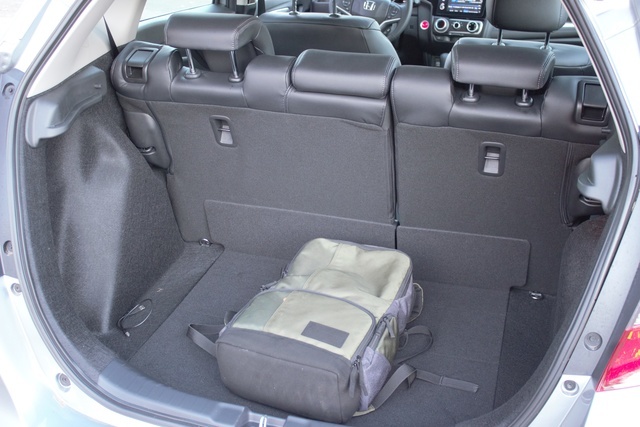 With those seats folded, the Fit has 52.7 cubic feet of cargo space. Not only is that more space than other subcompacts like the Yaris and the Spark offer, it’s more than some compact crossovers, too. It has more space than the Subaru Crosstrek we recently reviewed, and it has heaps more cargo space than the Toyota C-HR, which has just 36.4 cubic feet. There are very few cars this size with the usable space of the Honda Fit. It’s not just space that sets the Fit apart; it’s how Honda lets you make the most of that space. 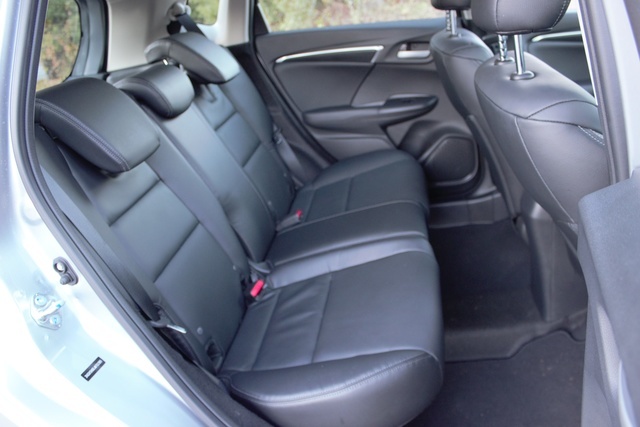 This is manifested in the Fit’s standard second-row Magic Seat. In addition to the 60/40 split-fold functionality, it can slightly recline, but its true genius is in how the seat bottoms can fold all the way upright. This allows you to take advantage of the deep second-row footwells. You can also slide the front seat forward and fold the seat back all the way down. When you do this, the now-horizontal seatback lines up with the rear seat cushion, providing an area akin to a cot where you can actually lay out. 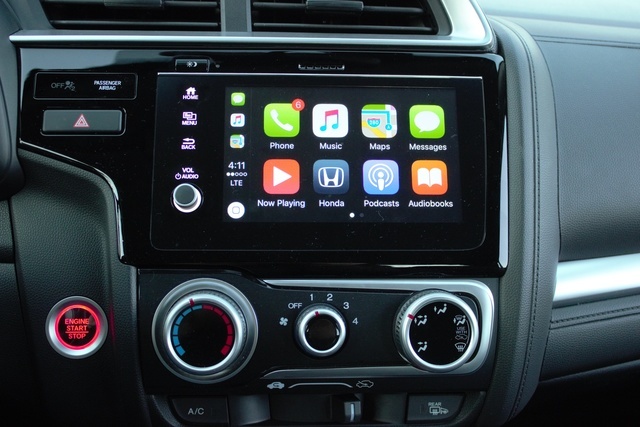 The Sport, EX, and EX-L trims of the Fit come with a 7-inch touchscreen. 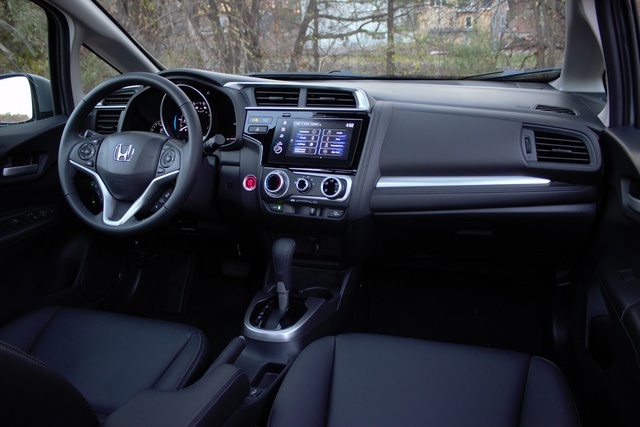 It's an improvement from past versions, but there's still a lot of work to be done to get to the point where we can call Honda’s system “good.” When the current generation of the Fit debuted for the 2015 model year, one of the big critiques was the infotainment layout. Aside from its lesser ergonomic sins, it didn’t even have a Volume knob. Instead, it had a touch-capacitive slide pad on the left side of the screen. This was a high-tech, complicated answer to a question no one really asked. Honda has obviously heard the critics, and the 2018 model finally has a Volume knob, but it’s very small. Compare it to the climate-control knobs, which are massive and easy to operate. But then you move up to the touchscreen and the volume knob is comparatively minute. Honda really had an opportunity to answer legit criticisms, but it comes off as a half-baked solution and a begrudging afterthought. Moving past the Volume knob, the screen’s layout is nothing special. The graphics look somewhat dated, and the menu layout lacks the logic of other systems. Luckily, there is a Home button to get you back to a familiar place if you ever get lost in the menus. For its part, the navigation system has decent graphics and even smartphone-inspired pinch-to-zoom functionality. But consider the basics: There’s no dial for changing the radio station. However, cycling through presets and audio sources is easy... as long as you use the steering-wheel-mounted audio controls. On the plus side, every model but the LX comes with Apple CarPlay and Android Auto. If you like using Spotify, podcasts, or even Apple Maps, using CarPlay is much better than interacting with Honda’s own software. Those systems also ensure you don’t need to put up the extra money for the available navigation system. The Fit also comes with a digital information display in the right dial of the instrument panel. It provides readouts for fuel economy, oil life, exterior temperature, and more. If you get the EX-L model, this display also provides an exterior compass and readouts of turn-by-turn directions from the navigation system. 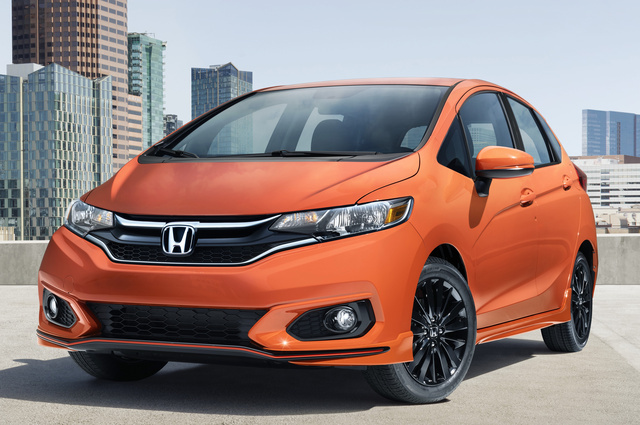 The Fit includes standard safety features such as front- and side-impact airbags, the LATCH child-seat anchoring system, a tire pressure monitoring system, and a reversing camera with multiple angles and guide-lines that turn with the steering wheel. If you move up to the EX or EX-L, you get Honda Sensing as standard equipment. Honda Sensing is a suite of safety features, which includes forward-collision warning and avoidance, lane-departure warning, and road-departure mitigation. Honda Sensing is also available on LX and Sport trims, so long as you get it with the CVT. Our Sport test model also came with the available Honda LaneWatch system. LaneWatch activates when you click on the right turn signal. It projects a camera view of the vehicle’s right-side blind spot on the center touchscreen. This feature proved really helpful when changing lanes or parallel parking. Other Honda vehicles really need this feature (the Civic comes to mind). But the Fit already has fantastic rear and side visibility, so LaneWatch is a value-add. Base MSRP for the 2018 Honda Fit is $16,190. The Fit Sport starts at $17,500, while the EX starts at $18,160. The range-topping EX-L starts at $20,520. Our Fit Sport test model had a sticker price of $18,375. The Fit, at times, feels like the bargain-priced subcompact that it is, but its overwhelming feel is one of a complete car, especially when you consider the competition. The Chevy Spark, Kia Rio, Ford Fiesta, Toyota Yaris, and Nissan Versa all have lower base prices. In the case of the Versa, the Fit costs thousands more. But you get so much more car with the Fit. It has the seat comfort, cabin quality, features, ride quality, and innovative storage options that make it a legit option for a daily driver. With all these other vehicles, you'll have to give something up, but with the Fit, you give up neither content nor quality to achieve this low price. In that sense, there are few budget options as well rounded as the Honda Fit. 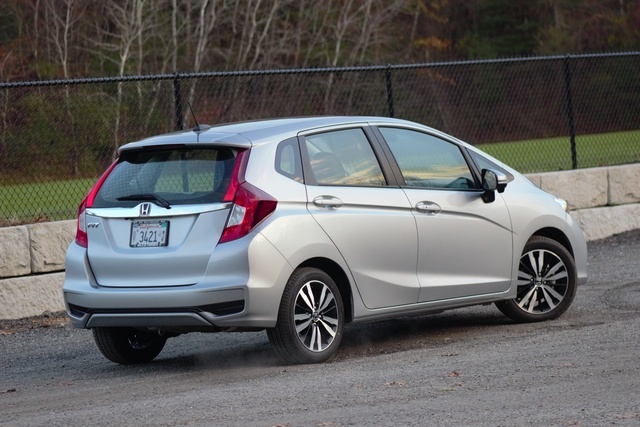 What's your take on the 2018 Honda Fit? Michael Need actual road impressions since Honda claims a quieter cabin - long overdue - this year. And, better handling, which has so far never matched the 2007 model. From the most recent press release: "The Fit's top-of-segment driving dynamics have been improved for 2018 with retuned suspension dampers, a more rigid steering system and additional body reinforcements. In addition to dynamic improvements, Fit now benefits from increased cabin quietness with improved transmission and steering system mounting hardware, combined with the addition of acoustic-laminated glass and more insulation throughout the vehicle." BTW I greatly enjoy your YouTube reviews. Drew C. Yes I too would like to know... won't buy one until Noise is actually good. Karter You realize you have the equipment levels all mixed up and that you're driving an EX-L and not a Sport, right? Brian How does the 2018 Honda Fit compare with the 2018 Subaru Impreza? The new Impreza boasts equivalent cargo space and improved fuel economy approaching the Fit's while maintaining AWD and higher ground clearance. Have you driven a 2018 Honda Fit? Enter your zip to see incentives for a new Fit in your area. Looking for a Used Fit in your area? 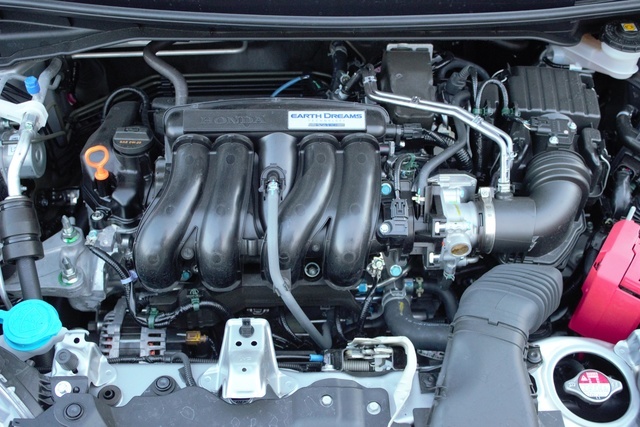 CarGurus has 12,526 nationwide Fit listings starting at $2,295. My 2018 fit makes a whee siren noise while driving. I cant find out where it is coming from, it dose it randomly. PLEASE HELP!